DEAR MAYO CLINIC: I need a total hip replacement and a total knee replacement -- both on my left side. Does it matter which procedure is done first? How soon after one procedure can I have the other procedure done? ANSWER: In a situation like yours, it's typically recommended that the joint causing the most symptoms be replaced first. If symptoms are similar, then it's usually best for the hip replacement to be done first. You'll need to allow about six weeks for recovery and rehabilitation after your hip replacement. Depending on your individual circumstances, you should be able to move forward with the knee replacement procedure any time after that. Joint replacement involves removing parts of an arthritic or damaged joint, and replacing them with metal, plastic or ceramic components that replicate the movements of a healthy joint. The surgeries you're considering are the most common total joint replacement procedures done in the U.S. About 700,000 knee replacements and about 400,000 hip replacements are performed in the U.S. each year. Hip replacement surgery is a slightly more straightforward procedure than knee replacement. That's because the hip is a basic ball-and-socket joint. Therefore, it's a fairly straightforward process to create and implant parts to replace that joint effectively. In contrast, the knee is a complex joint that allows for a wider range of motion and more flexibility. While the knee joint can be replaced successfully, the technique to do so may be more complicated and generally requires a longer recovery after surgery than the hip. The difference in surgical complexity is one of the reasons hip replacement usually is recommended before knee replacement. Another is that chronic hip pain can cause pain in other parts of the body, too, including the knees. This is called "referred pain." So, in some cases, replacing the hip may decrease pain in the knee -- possibly reducing it to a point that it could be managed with nonsurgical treatment, such as physical therapy, thereby making a knee replacement unnecessary. Performing a hip replacement before a knee replacement also is preferable due to the rehabilitation that's involved. For hip replacement, recovery and rehabilitation generally takes about six weeks. Regular activity and exercise, as directed by a physical therapist, can help that process. Although you may need to make some adjustments, having a painful knee usually doesn't disrupt the rehabilitation needed after hip replacement. For knee replacement, full recovery often takes considerably longer than hip replacement. And having a painful hip can interfere with the rehabilitation necessary following a knee replacement. Both hip and knee replacements have high rates of success when performed well by experienced surgeons. 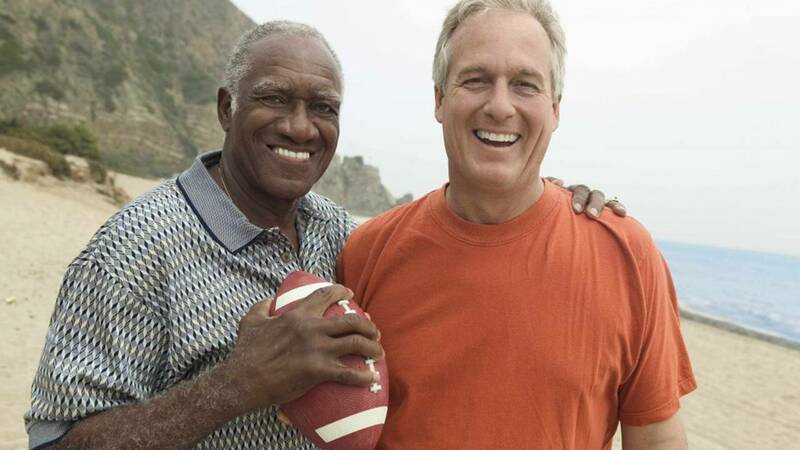 The implants used in joint replacements are durable, often lasting for decades. In people who receive a total hip replacement, about 90 to 95 percent receive almost total relief of pain following the surgery. Because of the intricacy of the joint, that number drops slightly for knee replacement to about 80 to 85 percent. Complication rates are similar for hip and knee replacements. Although the risk is low, infection is a possibility following both of these procedures. Complete dislocation is not a risk with the knee, but it can be problem with the hip joint after replacement. Knee joints, on the other hand, can be susceptible to instability after surgery if the ligaments aren't tensioned properly. Working with a surgeon who has expertise and experience in joint replacement can decrease the likelihood of these complications.